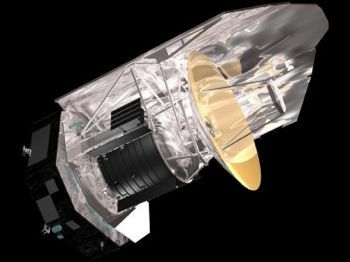 Astronomy, far infra-red and sub-mm wave satellite built by Alcatel Space Systems (prime), Astrium GmbH, Alenia Spazio for ESA, Europe. Launched 2009. Status: Operational 2009. First Launch: 2009-05-14. Last Launch: 2009-05-14. Number: 1 . Gross mass: 3,400 kg (7,400 lb). Family: Astronomy. Country: Europe. Launch Vehicles: Ariane 5, Ariane 5ECA. Launch Sites: Kourou ELA3. Bibliography: 6556, 12535. Herschel - . Mass: 3,400 kg (7,400 lb). Nation: Europe. Agency: Arianespace. Class: Astronomy. Type: Infrared astronomy satellite. Spacecraft: Herschel. USAF Sat Cat: 34937 . COSPAR: 2009-026A. Carried Far Infra Red and Submillimeter Telescope. After completing a successful mission, the spacecraft was sent into solar orbit and was deactivated. Herschel departed L2 on 1 April 2013 and was turned off on 17 June in a 1.04 AU x 1.06 AU x 0.19 deg inclination solar orbit.